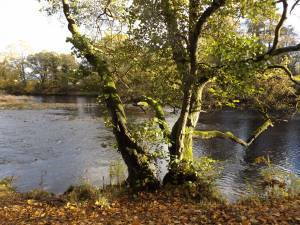 Location Gainford. The North Bank of the River Tees at the ancient river crossing named Geneford. 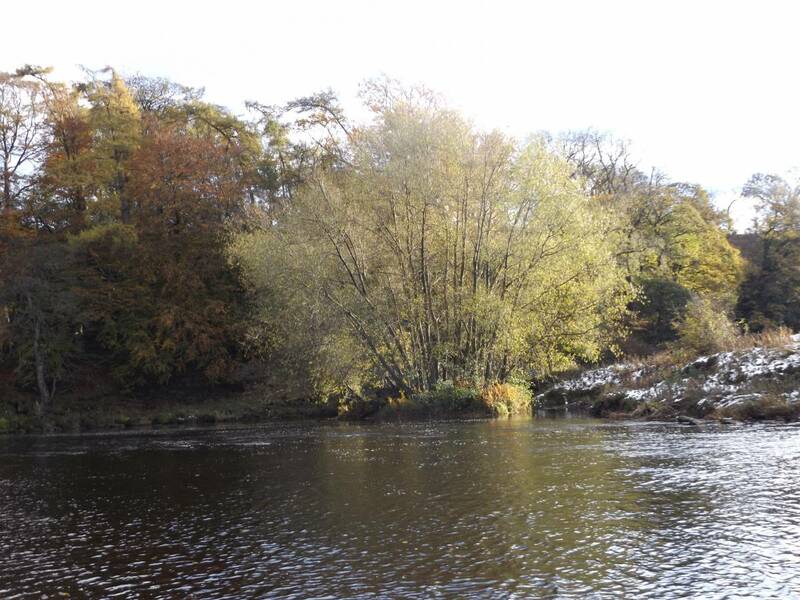 Record Name Fine specimen alders and willows on the banks of the Tees at Gainford. Record Description The fine coppiced alder photographed below measures approximately 5m girth at ground level. 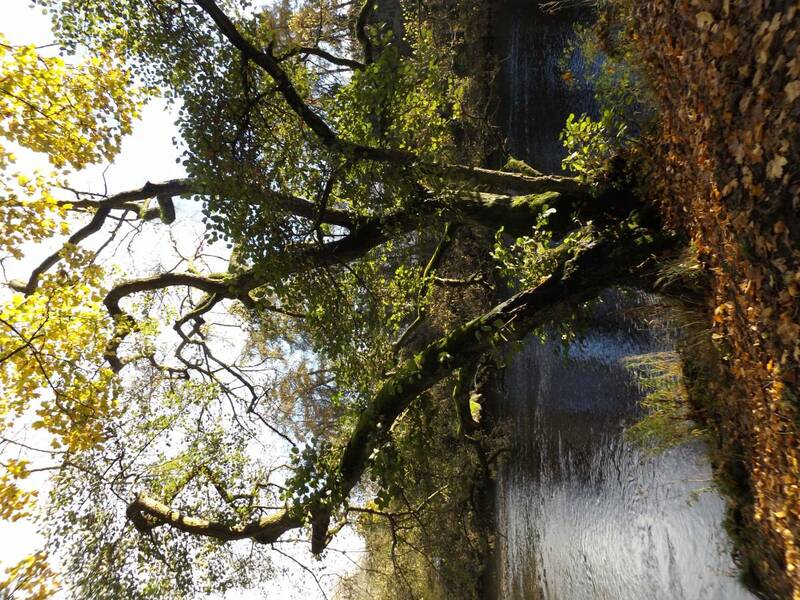 This tree grows on the North Bank of the Tees at the landing place of the ancient ford once named 'Geneford'. This river crossing is still very shallow and just about passable at low water in wellington boots. The river scenery at every bend and pool on the Tees, once a fine salmon river, is second to none. The quality of these riverside landscapes owes much to fine trees like the alder and the multi stemmed willow, probably crack willow, (Salix fragilis), recorded here. The Present Day Value of Alders: The over-riding significance of alders and willows today lies in their ability to form large root boles with many stems or trunks, and their very extensive root system, thus protecting river banks from erosion from high floods and consolidating river bank silt. Cattle drinking at in protected river banks make all river bank alders vulnerable to being cut out progressively by flood erosion getting behind the riverside trees. The multitude of uses to which alder coppiced timber and foliage were once put is summarised below. Additional Notes ALDER WOOD Historic uses mentioned by James Sowerby in his description of Alder (Alnus glutinosa) Reference: James Sowerby,â€˜English Botanyâ€™ Volume Eight, pp178-180. 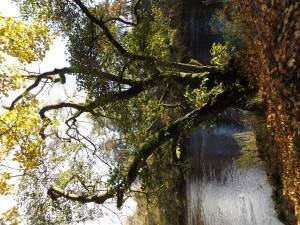 1.The alder grows- to form Alder Car- where very few other trees will grow- in the wettest, most swampy conditions. 2. Alder was used extensively in Flanders and Holland to make the piles of bridges and flood protection dikes. 3. Alder wood makes very durable fence posts in water but is vulnerable to rot when in dry ground. 4. Earliest boat building (mentioned by the Roman Poet Vergil). 5. Large quantities used in making herring barrels. 6. Bark of alder is â€˜very astringentâ€™ and used in tanning. 4. Young shoots used both for tanning and for dying red, brown, yellow and, in combination with copperas â€“ black. 7. Alder catkins dye green. 8. Alder female catkins used by fishermen to float their nets in place of cork. Highlanders make their own shoes and use alder and birch bark for tanning. 9. French cabinet makers use the knotty parts of the roots od alder as inlays. 10. Alder leaves were used as a â€˜detersiveâ€™ and as a gargle. 11. Alder foliage spread over fields through winter to rot and fertilise before ploughing. 12. Alder foliage strewn over floors to attract fleas which stick to the glutinous sap. Like birdlime. 13. Mr London tells us that the chief use of alder is as coppice wood cut down every five or six years and made into gun powder. Alder charcoal grinds down to the finest particle size and thus makes the best quality gun powder. Extensively used by the lead miners of Swaledale. 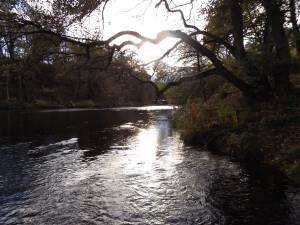 Image 3 Description The River Tees at Gainford, at the ancient ford connecting Gainford with the old village of Barforth and all points south. Image 4 Description A fine clump of willows probably Salix fragilis, on the south bank of the Tees at Gainfrd.